We love Crayola products in my house. My four year old is constantly coloring, painting and making projects. My 18 month old really likes to join in the fun but inevitably he makes a mess. The crayons are too skinny and hard to hold or her writes on the wall or table with marker. Well when I was contacted by My Blog Spark to do a review for My First Crayola I was thrilled. 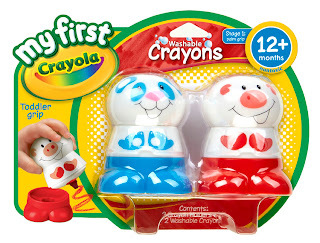 Finally Crayola products made for younger children. When my Crayola package came I was amazed at how many products there were. 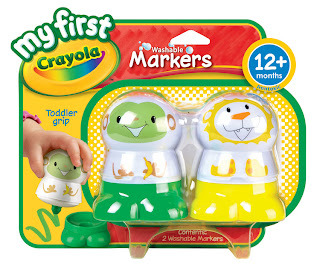 All of the products were My First Crayola products and are designed for children as young as 12 months. The first thing my son decided to try were the Washable crayons, stampers, and markers. I loved that these products were just the right size and shape for my toddler's hands. He did not have a problem gripping them and using them. I know he loved that they looked like animals and kept roaring like a lion the whole time he was coloring with the lion markers. During this particular art session there was no coloring on the walls but if there had been I would have been at ease since all of these products are washable. 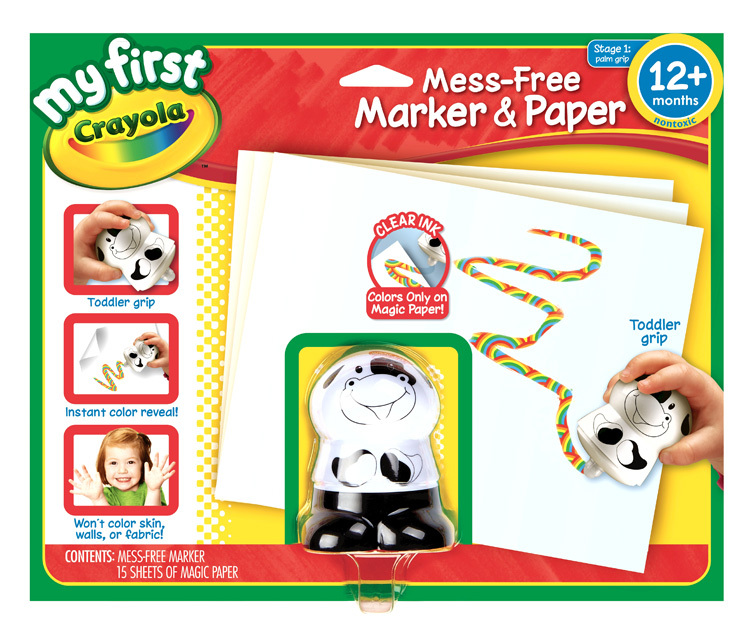 The next product we decided to try was the Mess Free Marker and Paper. These markers only show up on the special Crayola Mess Free paper. The markers and paints instantly show up on the paper but not on the skin, clothes or even on my table. 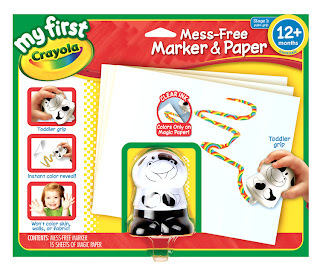 The Mess Free Markers and Paper are recommended for 12 months and up. Again my son was very excited that the marker was an animal. 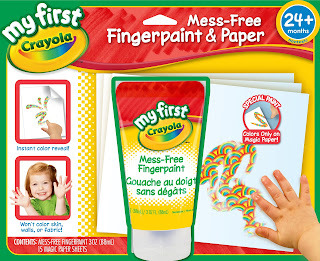 The Mess Free Fingerpaint and Paper is recommended for children 24 months and up. 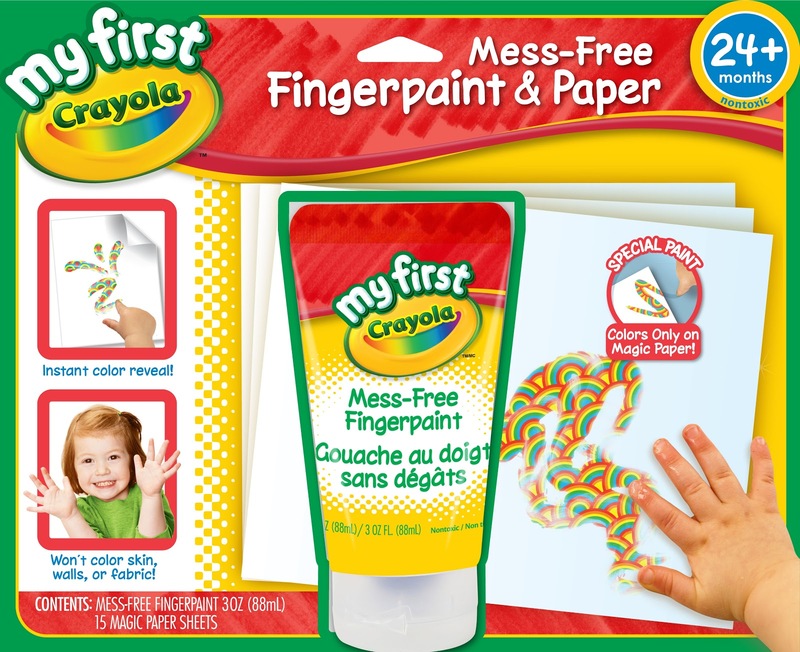 Personally my favorite My First Crayola product was the Mess Free Washable Dr Erase Activity Mat. I brought the Dry Erase Activity Mat to a restaurant one night when we were going out to dinner. Normally my son will not sit for more than five minutes but this activity mat really held his attention. It features 12 activities that slide into place on the mat so my son could draw, erase and draw some more. I really liked the triangular crayons it came with as well. They were very easy to hold and easy to erase. 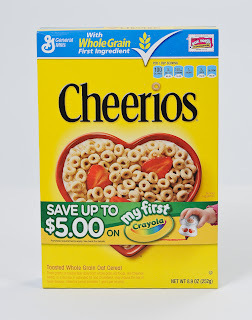 Crayola and Cheerios are currently offering up to $5.00 in coupons on My First Crayola products. 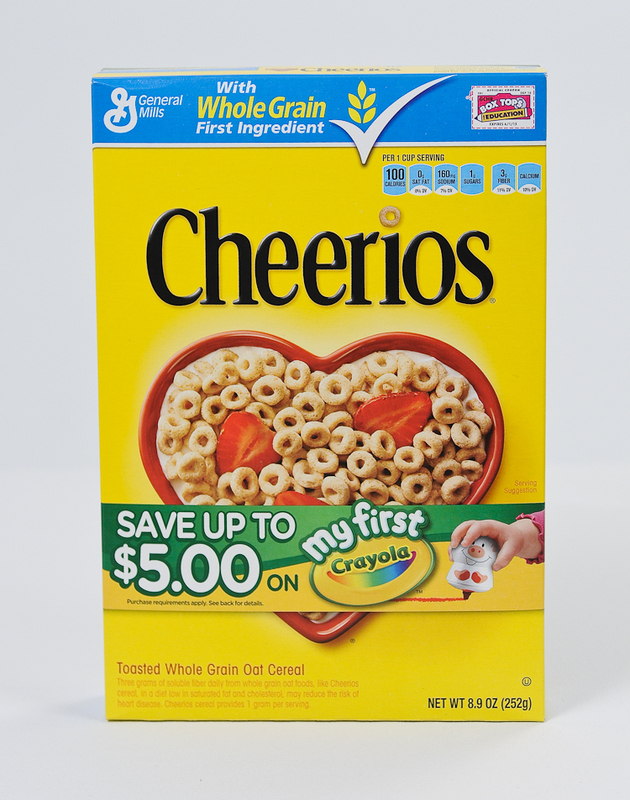 Look for My First Crayola on original Cheerios cereal boxes. To learn more about the tools from Crayola that make it easy for parents to help children develop the creativity visit www.crayola.com. 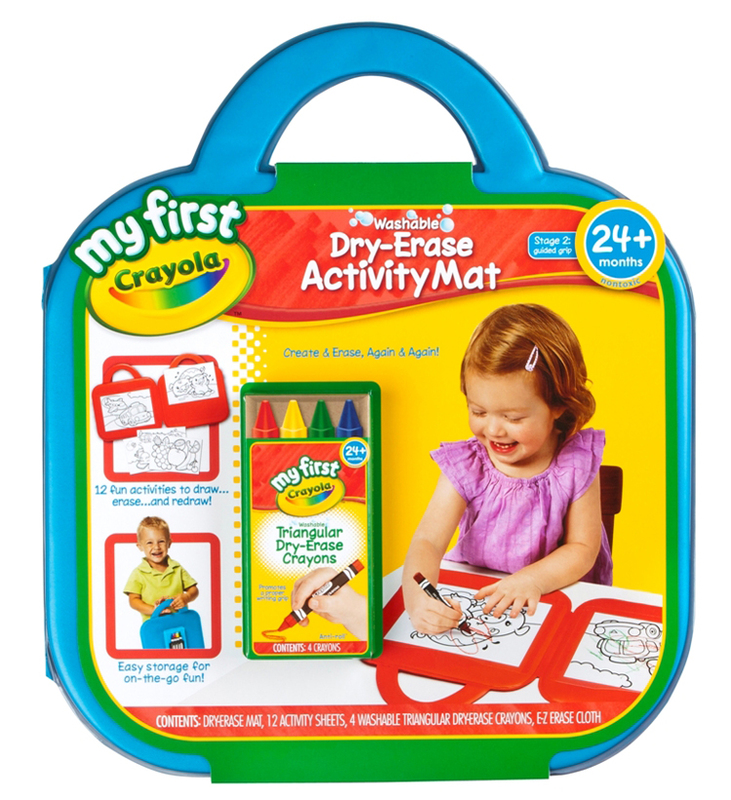 My favorite My First Crayola product is the Dry Erase Activity Mat. 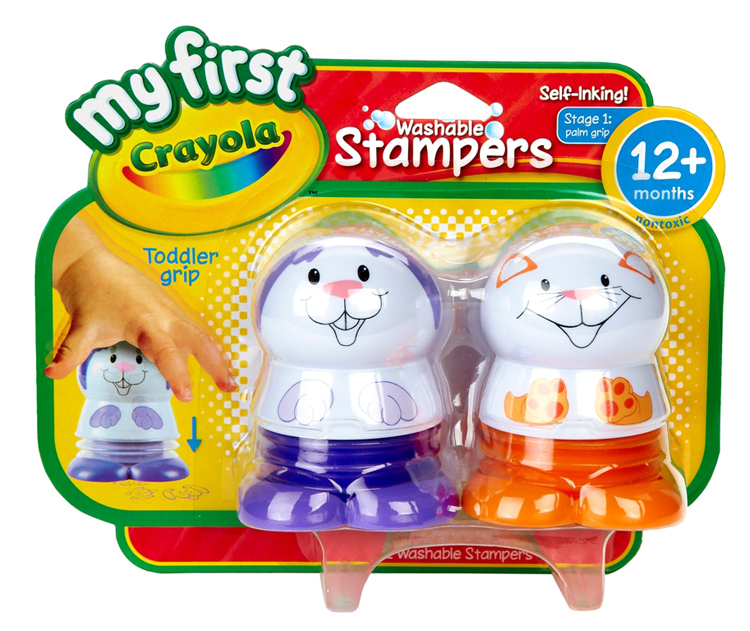 The Washable Stampers sound great to me! thanks for the chance...we love crayola in my house! 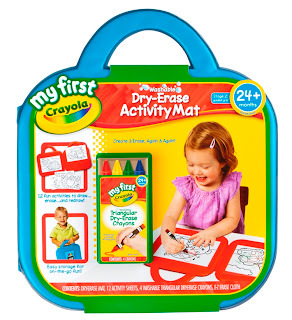 Mess Free Washable Dr Erase Activity Mat.